So many of Robyn Hitchcock’s songs owe their greatness to his wit and worldview. Over 35 years—first with the Soft Boys and then with the Egyptians, Venus 3 and solo—Hitchcock carved out his niche as a songwriter: clever, surreal, imaginative and poignant. So when his 20th solo album was announced as a folk record, mixing covers (both well-known and obscure) with a few originals, the first question became how Hitchcock’s singular artistic voice would show itself in the project. The title The Man Upstairs suggests that this record comes from a side of Hitchcock that’s always been there but is seldom seen. Hanging around, alongside his genius songwriting, is the voice of an enthusiastic yet reverent interpreter, one with a sharp sense of what songs to choose and how best to transform them. 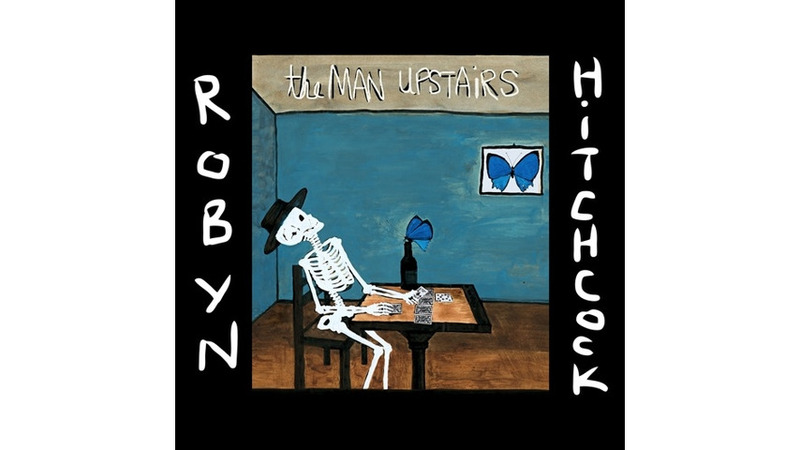 Hitchcock’s most formative influences have been starkly clear in past projects—the 2002 Robyn Sings album of Bob Dylan covers and a 2006 Soft Boys reunion concert performance of Syd Barrett-era Pink Floyd songs. But there’s nothing so cut-and-dried on The Man Upstairs. Instead, the covers are chosen out of a vault of personal favorites (and, as he says in Yep Roc’s press release, “songs I wished I’d written”) collected over the years. The album starts with “The Ghost In You,” the 1984 Psychedelic Furs hit, and immediately Hitchcock’s skill as a recontextualist takes over. Instead of the romantic bounce of new wave synths, Hitchcock strums an acoustic guitar through the chords, with cello and piano coloring the edges. It’s an approach that puts a direct emphasis on the lyrics, and suddenly it’s clear why Hitchcock is drawn to the song. With lines like “angels fall like rain” and “stars come down in you,” the lyrics inhabit the same exaltedly strange realm as many of his own songs. Similarly, when Hitchcock plucks Roxy Music’s “To Turn You On” out of 1982, he clears away the shiny production to lock onto the yearning at the song’s timeless core. Bryan Ferry’s commercial peak Avalon came two years after the Soft Boys disbanded, and while the album’s smooth synth-rock was miles from the psychedelia of Underwater Moonlight, “To Turn You On” has a lyrical semblance that’s clearly enchanted Hitchcock for decades. But by stripping the instrumentation bare, Hitchcock renders the song’s melody and lyrics with a more direct emotional punch. Sandwiched between those two new wave classics at the album’s front end is “San Francisco Patrol,” a Hitchcock original written in that city. It’s an aching, vulnerable song, and, his voice thick with longing, Hitchcock name-checks a series of streets (Haight, Fillmore, Geary) with a cadence that mimicing an aimless stroll. For anyone who knows the streets of the Lower Haight and Hayes Valley, it’s easy to imagine a heartbroken walk through those neighborhoods, the city coming alive with every step. Like “San Francisco Patrol,” Hitchcock’s other original compositions on The Man Upstairs are strays, songs that took their own paths, evolving slowly, never quite fitting in with other albums along the way. Coming from different periods in Hitchcock’s life, from different Hitchcocks in a sense, they parallel and complement the covers remarkably well. “Somebody To Break Your Heart” is jaunty and bluesy, with Hitchcock’s harmonica bursts a lively addition to the acoustic guitar. “Trouble In Your Blood” and “Comme Toujours” are stark and fragile, revealing a different side of the songwriter compared to most of Hitchcock’s more recent work—2012’s spacey, psychedelic Love From London and his creatively restless trio of albums with The Venus 3 (Peter Buck of R.E.M., Scott McCaughey of Young Fresh Fellows and Bill Rieflin of Ministry), Olé! Tarantula, Goodnight Oslo and Propellor Time. The record hits its lone soggy patch on “The Crystal Ship,” a slightly rote and incongruous version of the Doors’ hit amid an otherwise brilliantly selected batch of covers. At the reins beside Hitchcock is legendary British folk producer Joe Boyd, whose resume of work on Nick Drake and Richard Thompson records, as well as R.E.M.’s Fables of the Reconstruction and Billy Bragg’s Workers Playtime, perfectly encapsulates the sound of The Man Upstairs. Overall, The Man Upstairs is an exceptionally well-conceived and well-executed project from Hitchcock and Boyd. Everything on the album is stronger for its simple and unadorned arrangements, the sparse backing from Jenny Adejayan on cello and Charlie Francis on piano delivering thoughtful, emotional augmentation to Hitchcock’s acoustic guitar. Ultimately, Hitchcock knows how to find and deliver the simple essence of a beautiful song.